Is Child with Passing Grades Eligible for Special Ed Under IDEA? My child has struggled in school for years. He hasn’t failed because we provide private tutoring and work with him at home. We asked the school for special ed services. They say he is not eligible because he does not have failing grades. Is this correct? Nope. The law says just the opposite . . .
. . . that a child does not have to fail to be eligible for special education services. According to IDEA regulation 300.101(c), the school must provide special education to a child with a disability “even though the child has not failed or been retained in a course or grade, and is advancing from grade to grade. 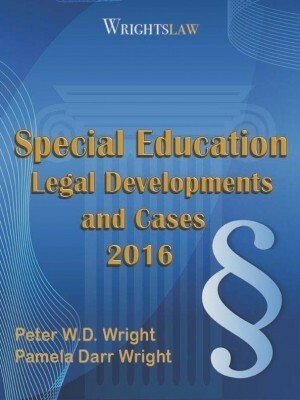 (page 204 in Wrightslaw: Special Education Law, 2nd edition). A parent or school staff member may refer a child for an evaluation. 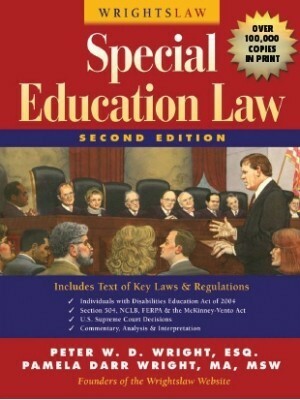 IDEA Regulation 300.301(a)(1) – Initial evaluations (pages 92-93 and 240 in Wrightslaw: Special Education Law, 2nd edition). To determine if a child is eligible for special education and related services, the school is required to do a comprehensive psycho educational evaluation. 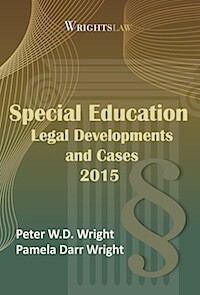 See IDEA, 1414(b) Evaluation Procedures (page 95-96 in Wrightslaw: Special Education Law, 2nd edition). Did the school complete a comprehensive evaluation on the child? What were the findings? As the parent, YOU represent your child’s interests. YOU need to know what the law says. Do not rely on what others tell you. 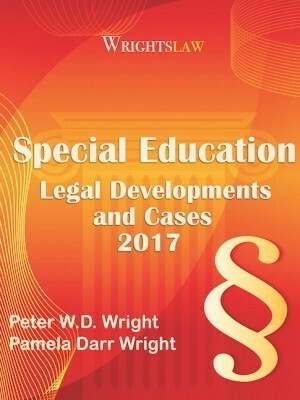 If you need answers to questions about referring a child for an evaluation, what an evaluation must include, and parental consent for an evaluation, read pages 92-98 and pages 238-245 in Wrightslaw: Special Education Law, 2nd edition. 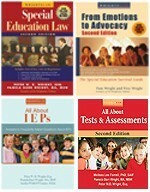 If you have questions about IEPs, read pages 99-107 and pages 245-251 in Wrightslaw: Special Education Law, 2nd edition. 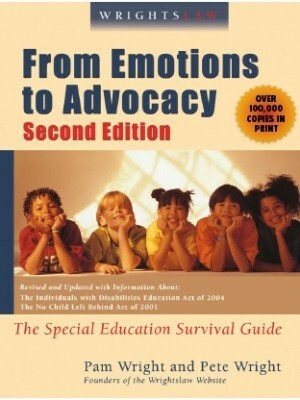 This entry was posted in Advocacy, Eligibility, IDEA 2004, IEPs, Special Ed Law, Tests & Assessments and tagged Advocacy, Eligibility, Evaluations, Grades, IDEA 2004, IEPs, Special Education Law, unique needs by Wrightslaw. Bookmark the permalink. My son was diagnosed with high functioning, mild autism spectrum disorder, sensory processing disorder and generalized anxiety disorder. In December the school said he did not qualify for observation/evaluation, but that a 504 plan would be sufficient to meet his needs. They also recommended we seek outside OT for him. After being evaluated by 2 OT’s we went back to the school again asking that he be evaluated. This time they agreed, however, at the eligibility meeting they again stated that his academics and their findings do not qualify him for an IEP. Our son is just finishing up kindergarten, but I want to be sure we have the best plan in place for him next year. What insight/direction can you provide? Is a 504 all that he is entitled to? My granddaughter has epilepsy and ADHD. She is passing grades because of tutoring and family help. She gets sleepy from the medication, she gets headaches and looses educational instruction. The district will not put her on an IEP. What can we do? My adult senior has an IEP with a transition plan consisting of 4 lines and no social or transitional goals for 2 years (even though I have asked and begged repeatedly. I Feb I got new diagnosis of ASD even though school said he was doing fine and there was no reason to evaluate further because he was/is passing grades. I have asked for social language goals and functional goals and transition goals for 2 years with platitudes and no services provided. The school wants to exit IEP.and graduate with diploma in 5 weeks stating he has good grades so does not qualify for IEP for anything other than reading writing or math….and all the recommendations from the neuropsych do not apply to his IEP and are for a 504Plan… (recently diagnosed A SD and extensive social emotional behavioral goal recommendations by highly credentialed, Board certified child neuropsych). School says he does not meet eligibility now because his ASD/OCD/AD HD do not affect his “EDUCATIONAL PERFORMANCE” because he is a sweet compliant boy with good grades. How do I respond to that and with what law (s). …he is incapable of independently washing, crossing street, driving, hardly speaks unless spoken to etc..
What to do if the school denies to do an assessment? you need to ask them to complete this assessment in a letter. They have 30 days to respond. The law requires them to complete testing. Thank you Arita, someone gives this person the real answer. Schools are absolutely required to test. Be sure to request it in writing and have your copy time stamped by the office when you drop off their copy. Best of Luck. The school is not legally required to evaluate, but they are required to respond to your request. Personally, I would try requesting again in writing, detailing your reasons for the request for documentation purposes. They should give you a handout with your rights and options (called Procedural Safeguards) if you disagree. I would read that carefully. I’m sure you can find it online if you’ve lost it or they didn’t give it to you. You can basically lodge a complaint with your state’s dept. of ed. At that point, someone from their office will get involved to determine if their decision not to test had merit, or if they are to be required to evaluate. 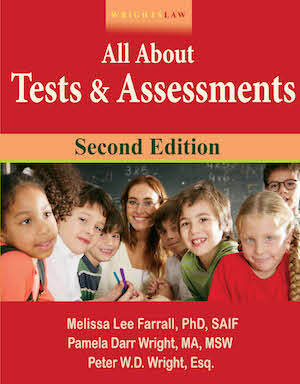 I have a child who is REQUIRED to take the state graduation tests in order to graduate and has LDs and an IEP. The school knows the student takes longer taking tests (double compared to peers), has LDs affecting reading, conventions, slow to grasp math concepts, short term memory, does better with smaller chunking and yet they will NOT allow any accommodations for the testing. Is this legal? The student makes A’s and B’s, but does NOT test well and become exhausted after 4 hours of testing in one day for five days. What can be done? My son in grade school was recently diagnosed with seizures. The school is willing to evaluate him for speech services but not OT services. His neurologist has written a script for OT because my son’s hand writing is terrible. We have been paying for OT services at our local hospitals OT rehabilitation unit. The school district has denied OT services because hand writing doesn’t effect his good grades. Can they deny him OT based solely on his grades and what else can we do to get him the services he needs for OT. OT and the neurologist are willing to write why they fell he needs OT. The problem with OT services is your child cannot qualify for special education solely due to OT needs, there must be a processing disorder and a discrepancy to qualify under Specific Learning Disability. If he qualifies under Speech or Language Impairment, he could also receive OT services. I would like to see some response by WrightsLaw re Common Core and the devastating effect it is having on IEP students. My child has ADHD & ODD. He had problems in K & 1 grades. We asked for testing were told to go do it on our own. Did it and put him on meds for the 3 & 4 quarters of school. grades & behavior improved. We asked for and IEP. Then they told us they had to test him and not use the IEE. They tested him and found no problem. They tested him on the meds which show that the meds are working and he is improving. Can they still say no to an IEP, if the IQ and grades differ. He should have better grades based on our IEE. Still a problem at home & social withdrawal. Our son was denied for the exact same reason. ALL LAST YEAR we had both behavior and academic issues, yet the denial is based on his academics and behavior for the under 2 months he has been back in school. He qualifies under both OHI & ED, if you use all his records from last school year, however, they are only using these last few weeks. Had someone read the review and they said the school/district worded it so if any of the manifestations appear again, not only would it be too late, but we could face a lawsuit. They allowed HIM to take the roberts depression test for school & home, rather than both. Off the charts for home, happy as a clam at school – therefore, no problems. WHY WAS THAT NOT A RED FLAG????? Our school stops at that question and has determined my child is not eligible for services AND that she does not even have a disability (dyslexia tested by a professional) because she was in the average and above average range is parts of the testing. What is wrong with the school’s use of criteria in this case? Her recent CAPT showed her reading below the school goal and school average, though every other year she was above average. Your “eligibility questions” for the IEP team to answer are too simplistic. For example, a disability could affect a child’s educational performance, but that does not mean he or she requires special education services. Shouldn’t it read “adversely affect” and shouldn’t that mean “adversely affect to such an extent that we cannot help him or her in the general education classroom without some kind of specialized assistance, since what we really do want is to keep the child in the regular classroom even if he or she needs to use a hearing aid, books on tape, gets modified assignments, etc.”. How does someone who is passing classes with A’s and B’s require special education? You seem adamant that everyone should qualify for special education. What about eligibility criteria? My son is an A-B student (with the exception of conduct which is usually a D) and has an IEP for a dual diagnosis of autism/adhd. While he is passing his tests, he is also unable to function well in a classroom. He often wanders away from his desk during instruction, will impulsively go to the teacher to talk to her about unrelated information while she’s teaching, refuse to do his work or only do part before vocalizing/humming/whining/etc. He disturbs others because he invades their personal space because he doesn’t understand the concept of personal space. There are plenty of reasons why a student would need an IEP even though they’re progressing academically. What about the kids who are adversely affected emotionally by aspects of the classroom or subjects that produce such anxiety that they run out of the classroom, hurt themselves or come home every day and have meltdowns or threaten suicide. Sometimes they cannot complete homework or even TALK about their anxiety because they have completely shut down? It is not as simple as saying that kids who get A-B’s don’t need special education services. It is all dependent on the actual disabilities they are diagnosed with and whether their schools are willing to help them instead of doing nothing and forcing parents to take them out of school to homeschool or go to private school. I know I cannot personally afford private school, and can’t quit my job to homeschool. Grades are subjective. My child with As and Bs in fifth grade was reading at the second grade level. Teachers often give kids high or passing grades regardless of actual skills. I do not trust grades and instead compile a portfolio of my child’s actual school work and compare it to grade level standards. I had to put her writing sample in front of the Director of Special Education and Superintendent and ask, “Is this 5th grade work?” “No, it is about second grade”, they replied. Yet my child had As in language arts. Do not trust grades! My daughter who is now in 10th grade was diagnosed in 1st grade with NLD and ADHD. She has made great strides in school with the help of IEPs. now that she is making good grades and “doing” what is expected the school wants to take away her IEP. The school psychologist even went so far as to say that she doubts my daughter has a learning disability. 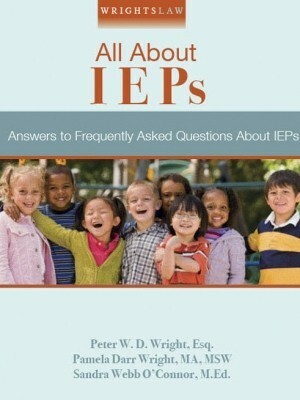 I believe my daughter still needs the IEP to continue to be successful in school. She utilizes the help that is provided to her through the IEP. Is this legal? An IEP cannot be taken away just because school personnel feel the child “doesn’t need it.” Hopefully this child has received a comprehensive psychoeducational evaluation by now. My child is in the first grade and having problems with working in groups but by herself she does better. But her teacher says she is barely passing. I help my child every day with homework, reading and she is barely passing. I don’t know what to do at all. Can someone give me advice on what to do!!!! My daughter is in 11th grade and has a IEP! My question she makes all A’s @B’s and passes her classes and exams but cant pass the 11th grade SOL. Does this mean now she wont get her diploma but will only be aloud to walk and get a paper stating that she went to school for 13 years and have to then go try to get her Ged? We live in the state of Virginia! Really concerned everything she takes is pencil paper! No – with an IEP she can keep going to public school until she’s 21, which gives her several more years to pass the tests she needs to pass. My son is in 9th grade. Has autism level 1, adhd, and auditory processing disorder. Recently re-diagnosed by school. Failing all core classes, state testing indicates he is years behind. District says he doesn’t qualify for an IEP and offers 504 with no services – just proximate seating, etc. which is not even enforced. I pay for a tutor which helps but can not replicate the 7 hours a day he is in school. He can’t discern important information from incidental information and had never had a friend. I filed for impartial hearing 6 months ago but it never happened. What can I do? Karolyn, read the many posts on dyslexia–use the search tool on this website. This is quite common and they boy, regardless if he has dyslexia or not, needs specific interventions. There are many stories of schools advancing students with low reading levels without providing appropriate interventions. Many kids do graduate with low reading levels. It is wrong. Research the “achievement gap” and see how pervasive it is. Direct parents, if they are willing to work with you, to Wrightslaw and an advocacy center. Yes, he will continue to advance grades and graduate with a 2nd grade reading level, no knowledge of assistive technology, reading interventions, etc. It is not too late for him to learn to read and not to late for him to learn to use AT. Are his parents open to learn ways to help him? my son is 13 adhd asbergers, he has always been in co-teach or had an aide until recently. because his organization skills were so bad the school recommended resource room, but in order to get that they told us he could not have co-teach, but if it didn’t work out we could change our minds. well, resource room is first period so he has nothing to organize and he is not getting the hw. the grades are starting to fall and he is getting overwhelmed. I have had 4 meetings to address the problem and put him back in co-teach. now the cse chairperson told me that a ny state law prohibits them from doing this b/c he has good grades. it makes no sense. is there such a law? My son has autism, eating disorder but he is also gifted. We are active duty military. He has an iep from past two schools he was at to address his social issues and also monitoring his eating. We moved to va last summer and the new school dropped all his social goals when they convert from our last state to va format. They stated that because according to va law that students who does not have below average IQ they can not have goals or objectives on their iep. They stated that they believe a 504 plan would be more appreciate for them to just address his eating issue. Now we just had a iep eligibility meeting and the district stated since my son’s testing showed he is above grade level therefore they found him not eligible for an iep. This is also the same reason they can’t find him eligible for 504 plan, neither. Can they do that? Child in 6th grade… He is in special classes for learning disability… Add/parents do not want him medicated…He can not even read at a first grade level… He wants to learn and seems to be getting Alittle better with practice… He comes over and reads with me…Teachers say he will continue to advance grades… Even if he can not read??????? I don’t understand this? I didn’t think this even happened in colorado/ the world…any information about this? Is this lawful? Do you mean a triannual review? If so yes. Can a parent waive the right to an annual review? when a school eval is done and special services are put in place. Is it the same as a Medical diagnoses? My 11 y/o ADHD son gets good grades. Struggles with executive function. In Oct school: 1. Said ‘We’ll try RTI’, didnt. 5. Inclusion teacher & aids give multple verbal prompts to redirect, extra test time & inconsistently, visual aids. 7. At initial meeting said if we stop our support at home, give only 1 hour for HW & grades slip then he’d get services. 8. Verbally Denied IEP/504 b/c “He’s progressing upwardly, citing good grades& Star computerized results. So no 504 with good grades? I had problems with my son getting proper writing skills in school so I hired a professional speech & language therapist to review his skills & work with him. She was able to come to the IEP meetings & speak to the school speech teacher & together we came up with a plan for my son to write 3-5 paragraph essays with at least 5 sentences in them. Prior to hiring this outside professional I was not getting anywhere with the school either & they were not helping my son very much. High IQ does not mean no services. Services are based on need. What happens if the child has IEP but the school refuse to provide any resource help for academics. My Asperger son happen to have IQ in the 140 range but is not learning much in school but we are not able to got any services to help him academically. My son is in 6th grade and he is not able to do multiplication, division, fractions, etc. but the school is passing him every year and say he does not need any academic help. He writes 3 sentences on his essay test and they told me, it’s fine he is within the “average” range for 6trh graders and does not need any help. He is exceptionally good with spelling and vocabulary so his English language “AVERAGE” is C. ( A+F)/2 = C therefore he needs no services. Does the special education student (LD) receive on the report card indicators that the student received a modified grade especially if the students was still doing the work only with accommodations? Can a school legally tell a student with an IEP or 504 that they cannot play a sport due to one F in one subject? Is this policy enforced for ALL students? If not, then I would address the issue w/ administration. Why did the child get an F? My son has Epilepsy & ADHD. We have a 504 plan for him right now. We have the results of a Neurological Test stating his severe learning impairment. We have been denied an IEP. His IQ is 121. Highly intelligent. He has trouble processing information which is giving him just passing grades. Teachers are not following the 504 plan. How and what can we do to change their minds and let him get an IEP? My son has hydrocephalus and MELAS, just got an IEP BACk again after 8 years of trying. He is now in the 9th grade. It was taken away in kindergarten (what can they really judge in kindergarten?) due to he was keeping up with his class, if only I had known the struggle we were in for at school. In 4th grade I spoke to the school about different issues that were still there, I was blown off, he never got the IEP he needed. Finally in 8th grade the school noticed the problems and now he got a IEP again. How many kids have to suffer due to no money in the school system or nonqualified teachers to help these kids? Mine did and will the rest of his life! If your kid is failing it is a lot easier to get help from the district……my word to the wise have medical professionals on your side! 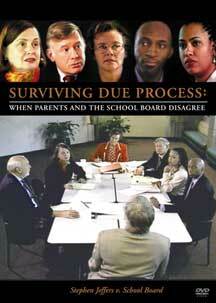 Refer to your schools procedural safeguards regarding independent evaluations. Your school should be providing you with a copy at least once a year. Also, ask if your school has a list of independent evaluators. Most have a list. Ask. I had what was supposed to be an Evaluation Planning Meeting today with my 15 year old son’s school, who instead spent 45 minutes of the hour scheduled to argue against an IEP. (He is elibile under OHI, LD & ED due to Tourette’s, OCD and ADD.) They insisted that due to his grades, he does not NEED special education & did not listen when I tried to explain the struggles that go into his passing each grade. So, I believe he does need special education. Can they deny us? My son has had an IEP Plan in a Fl high school. He has had an IEP since his elementary grades. He takes medication for and has asthma and ADD. He was ineligible for sports last year (9th grade) and will be ineligible again this year due to an unqualified GPA. Due to his poor organizational skills and attention deficit he will most likely never have the required GPA. He has played soccer since he was 5 years old. He gets most of his confidence from his success in playing soccer and not being able to play for his school is really affecting him negatively. He is ashamed and embarrassed. He puts in so much effort and still loses assignments, completed work, etc. Shouldn’t he be qualified to play sports due to his disability regardless of his GPA? Thank you in advance for your response. I have a meeting at school this Monday the 21st. Help now please. I have a 11 year old daughter with very high functioning Asperber’s. Last MFE done two year ago. All academic areas average or above average. Socially she is very concerte and misses small slangs. She was adopted when she was five and also has some mental health issues. At school she does not communicate when she needs help, looses papers, and will not write down assignments. She has poor fine motor skills. Pragmagic speech is also a problem. All of this is stated repeatly in her MFE. She also has documentation from children’s hospital that at some point academic performance could be affected by her Asperber’s. School does not want to give her any help. What now??? How can I find out what types of services the school should be providing for a child w/ADHD and who is already on an IEP. The child is still struggling even though he is suppose to have reduced assignments and longer time to do assignments. It is up to each teacher to decide how much to reduce assignments. Great post, and something that a mom behind me at your Charlotte conference was surprised to hear. My 8 year old son has autism (high functioning). He has always been fully mainstreamed. He makes all A’s and B’s. In fact he participates in the school’s Gifted & Talented program. In 3rd grade, he also scored “the highest math MAP test score [the teacher] has ever seen”. She previously taught 5th grade. But all that does not mean he doesn’t have a disability, and doesn’t need an IEP. He does, and he has one. It targets speech/language, social skills, and “abstract thinking”, so to speak. How to answer non multiple choice questions. How to figure out what a question is asking. Glad this question is clarified for so many who assume you can’t be in special ed AND gifted and talented at the same time! I would like to know if a school can (legally)dismiss a medical diagnosis and deny an IEP and/or social services because their psycho-eval/testing did not score “low enough” for such. Also, since my child’s grades are not failing, they say they (again) do not have to offer services, give an IEP or a 504. What are my legal rights and how do I go about finding these? My son had a neuropsychological evaluation due to (IVH, hydrocephalus). The result of the evaluation determined that he has neuropsychological complications. I had the evaluation done a year after he should have graduated from high school because after several attempts he just could not pass the high stake test because he never had the proper accommodations. When in school he had passing grades however he was never considered for any special education such as IEP or 504 accommodations. As a result he was not able to obtain his diploma because he could not pass the high stake exit exam- the Ohio Graduation Test. Now that I have the result from his evaluation I went back to the school to see if he should have been exempted from taking the test. What are my options? Was the school responsible? What is the law? We have a 5th grade girl with multiple problems: trauma from hurricane, abuse and abandonment by mom, fetal alcohol, trauma of new home, the list goes on and on. Each year her grades have declined and her behavior is worse, social skills are non-existent. Each year we raise red flags to the teachers. When she failed the standardized math test this year we asked for evaluation for special ed and we were told she has to fail the test in order to be tested, and even if we start the process they will drop it if she passes her re-test. I see a little girl at risk and the school isn’t helping us. 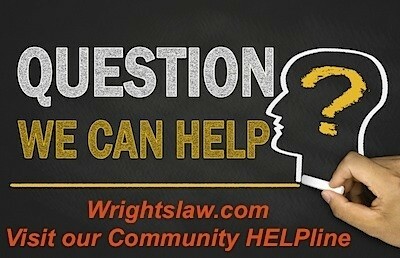 All this Wrightslaw information is so confusing – is there an outline somewhere that we can narrow down the info that we need to know, or do we have to wade through it to hopefully find answers on our own? Jodi – Yes, look into getting your daughter on an IEP under OHI (Other Health Impaired). Request from the school their policy on how to obtain one. When we did it for our son with ADHD, we had to have out physician fill out the school’s document stating that our son had ADHD and fill out the form as to how he would benefit from an IEP. We had our son on a 504 and it did not work for him.The laws are vague, and there are more rights and accountability under IDEA. 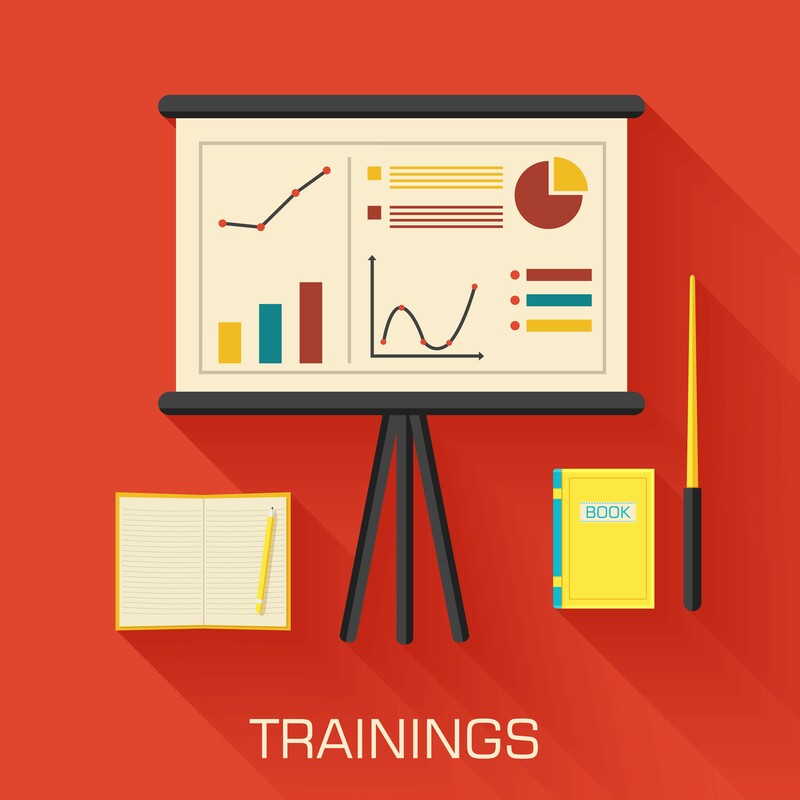 You need to work quickly and don’t sign anything until you get this information. If the school denies you, don’t sign. The school must give you a Prior Written Notice about why they will not honor the doctor’s recommendation. In that case, you can seek professional help from an attorney.